Henry, the youngest son of William the Conqueror, was born in September 1068 in Selby, West Yorkshire. With two elder brothers, his prospects of becoming king were slim. But fortunately for Henry, Robert Curthose, who had inherited Normandy, and William Rufus, who had been given England, did not get on, resulting in William invading Normandy and deposing his brother. William Rufus was surprisingly adept at making enemies and when he was killed by a stray arrow while hunting in the New Forest, rumours of murder were rife. Henry, who was one of the hunting party, seized the opportunity. He raced to Winchester to secure the throne - and the royal treasury - before making his way to Westminster, where he was crowned King Henry I four days later, on August 6th 1100. He was 32 years old at the time and now - as succession was suddenly important - needed a wife. He chose Princess Edith, daughter of King Malcolm Canmore of Scotland and his wife Margaret, the granddaughter of the Saxon King, Edmund Ironsides. The couple had two children, Matilda (Maud) and Henry's heir, Prince William. For a man of his time, King Henry I was very well educated. He spoke and read Norman French and Latin, but also made an effort to learn English, a rarity amongst the nobles of that age. He was also a skilled administrator and consolidated Norman rule in England. 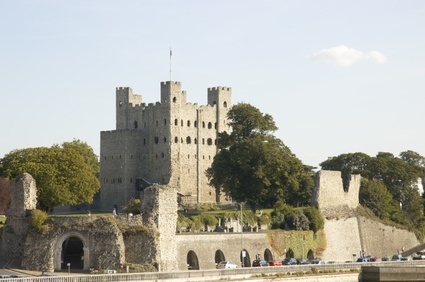 When Henry's brother Robert Curthose returned from crusade and resumed his rule of Normandy he proved so inept that the Norman barons offered the dukedom to Henry. He accepted, took an army into Normandy and defeated his brother at the battle of Tinchebray. In 1109, Henry's young daughter Matilda, then only 11, was betrothed to the German emperor Henry V. They were married five years later and Princess Matilda became Empress of Germany. The marriage remained childless, however, and when the German emperor died in 1125, Matilda returned to her father's court. By that time, Henry I's reign had been struck by disaster. In 1120, his only legitimate son, Prince William, drowned with many of his contemporaries during a Channel crossing, when the "White Ship" ran aground and sank. According to popular opinion, all the passengers and most of the crew were drunk. The king was devastated and contemporary chronicles report that he never smiled again. 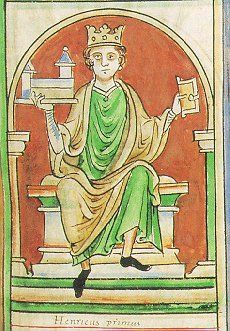 He married for a second time in 1122, but though he had sired 20 illegitimate children, more than any other English monarch, the new marriage remained childless. Increasingly concerned, the king designated his daughter Empress Matilda as his heir and forced England's nobles' to swear allegiance to her. In August 1135, Henry I left England for Normandy, where he died on 1st December 1135 at St Denis-le-Fermont popularly from a surfeit of lampreys (eels) but probably from heart attack. He was 66 years old. His body was mummified and eventually interred before the High Altar of Reading Abbey. His remains were lost during the Dissolution of the Monasteries and only a large Celtic Cross remains on the site in his memory. Return from King Henry I to the English monarchs page for more information about England's fascinating rulers. You can also follow the England Blog!